It was a few months ago that I was communicating with Cathy Stansbury, the USAPA Ambassador in Daytona Beach. I mentioned that Rich and I would be vacationing in Cocoa Beach in May and so plans were made to get together, and then we made plans for Rich to provide a Skills/ Techniques Clinic for their players. The Clinic took place on Saturday May 25th. Cathy Stansbury does a great job promoting pickleball, and not just in her home community of Pelican Bay - where with determination she spearheaded the conversion of two tennis courts to four beautiful pickleball courts, but to ambassadors and players in the surrounding cities and counties. We arrived to an array of goodies, pastry, fruit and juice set up in the clubhouse near the courts, donned our name tags and were introduced to somewhere between 35-40 players who would be attending the clinic including fellow ambassadors across Volusia County: Carol Fiore - Deland, FL, Maxine Sharp - Ormond Beach,FL and the recently appointed ambassador also from Deland, Meryl Baker. After a very active question/answer session - mostly on the "official rules" we took to the courts. Sixteen of the players were selected to participate and were able to get some "hands on" practice. Following the instructional part of the clinic all the players took to the courts for a game, while Rich critiqued their play. We hope that everyone enjoyed the day, learned a few new skills to improve their game, and had as much fun as we did! CLICK HERE to see more great photos! We were also introduced to Dave Vander Weide, who drove over from Winter Garden, FL, in Orange County. 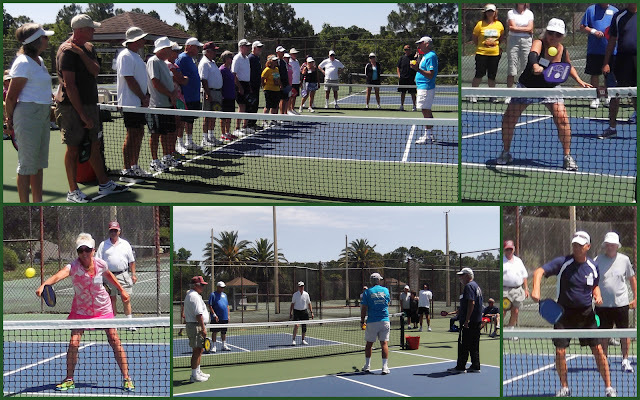 We were so impressed with his story of promoting pickleball that we wanted to share it. He and his wife live in a gated community in Winter Garden, FL which limits access, but where they are allowed to invite guests to play on their three courts. 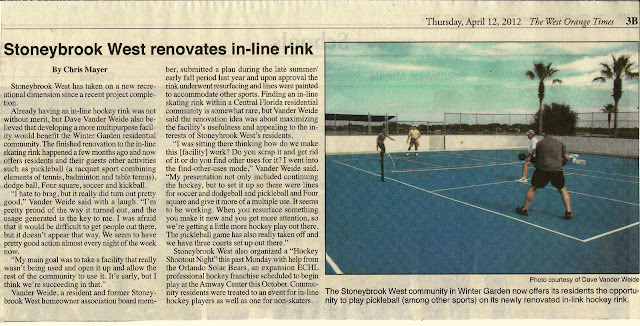 The (picture) article below tells the story of how those courts, shared with the in-line hockey players and soccer players came about. After play, they need to store the nets and plies and cover the anchor channels in the surface with metal plates. The courts have already been the hose of one tournament and Dave hopes to have more. We are in the beginning stages of developing the sport in the area. Before our courts were put in place, I don't think there were any in the Greater Orlando area. I have had contact with the Winter Garden Recreation Department as well as Orange County. It's a matter of educating and demonstrating the sport to them. They have to be shown there is a demand for the sport and the popularity. Once that happens, I think I can get them to put some public courts in some of the parks. That's were I am trying to raise some money to produce brochures, buy some balls and paddles for demonstrations. Travel and other activities related to promotion cost money. Dave had a shirt shop make up some shirts (pictured above) for personal use and was very excited about the quality and appearance and thinks that selling them may be one of the best was to promote the game. He had some great response at the clinic at Pelican Bay. These shirts are not your typical pickleball t-shirt. They come in a multitude of colors for men and the V-neck for woman, and are that very light weight "more-dry type" of material. Dave can be reached at 407-877-6661 if you'd like more information or would like to purchase one of these shirts! Gherkin born Friday, May 3rd!